As of 1st January 2011, all new bikers who don’t hold a category A, A1 or A2 motorcycle licence must attend a compulsory course of 7 hours to be eligible to ride a 125cc motorbike or scooter in France. Only those who can provide evidence that they have been riding a 125cc machine for at least the last five years are exempt from the course. But those who have been riding a machine owned by their employer or not been the main rider on the certificate of insurance are not eligible for the exemption and must complete the course. Anyone with no full bike licence caught riding a 125cc machine without proof that they have completed the training course can be liable for a fine of 135 euros and have 3 points taken off their car licence. The French Government has recently taken draconian measures in an attempt to reduce the number of motorcycle accidents on the roads. Statistics have shown that a large number of motorcycle collisions involve riders of smaller size machines, particularly those without a full bike licence. In an attempt to reduce motorcycle accidents, the French Government initially proposed to introduce a compulsory technical and environmental test on all motorbikes and scooters, equivalent to the MOT in the United Kingdom. Only four wheel vehicles are subject to this test in France, bikes are exempt. The Fédération Française des Motards en Colère (FFMC – French Federation of Angry Bikers) worked very hard over the last couple of years to demonstrate to the Government that the introduction of an MOT for motorcycles will not have any impact on reducing bike accidents, since technical faults are responsible for less than 1% of motorcycle accidents. This proposed MOT was only a pure attempt by the Government to impose a new stealth tax on motorcyclists with no impact whatsoever on the objective that this test was supposed to achieve. This technical and environmental test has not yet been introduced because the FFMC has managed to make the Government think twice and delay its introduction until next year. The new 125cc training course seems to be a one-off course that new riders must complete before going out on the road for the first time. It costs in the region of 300 euros and comprises a total of 7 hours with no examination at the end. It is a skills based course and riders must demonstrate that they have acquired the necessary basic skills to ride a 125cc machine safely on the road. At the end of the course, they are given a certificate of attendance that they must present along with their car licence on demand, otherwise they are liable for a 135 euros fine and 3 points off their car licence. To be allowed to complete the course, riders must hold a full car licence for at least two years. The course covers theory and practice. The theory module lasts for two hours and is designed to make the rider aware of the various accidents in which they can be involved and teach them how to anticipate hazards to avoid collisions. The course continues with two hours of practice off the road for riders to familiarise themselves with their machine and the main manoeuvres they will need to be comfortable with on the road. 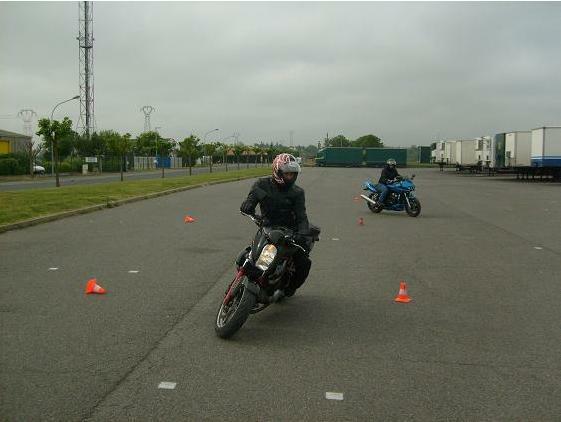 The course finishes with three hours of riding on the road with an instructor during which trainees will be required to go through junctions and roundabouts, change lanes, overtake other vehicles etc. This new French training course is different from its United Kingdom equivalent (called CBT – Compulsory Basic Training) where the theory part is kept to a minimum and the practical on-road training is shorter (only two hours). The main difference however lies in the cost and frequency: 300 euros or 260 pounds for a one-off course in France versus about 100 pounds in the UK for a compulsory course every two years. Whilst UK riders who have attended a CBT course and subsequently obtained a full bike licence are not required to go through CBT again, French riders who have attended the course are not required to attend it again, regardless of whether they have subsequently obtained a full bike licence or not. UK France bikers.com supports the French initiative that consists of properly training new bikers, however, we have concerns about the course being a one-off. We think the UK system is more appropriate whereby trainees are required to attend a course every two years to refresh their skills until they decide to prepare for the full motorcycle test. Hmm, thanks for the useful article. This is the first I’d heard about this! So as a rider who has only been riding his 125cc in Limousin for the last year, it looks like I’m now riding illegally? Do you know where I can find / book one of these courses, please? What should I Google for? I’m not sure where to start looking! Also not speaking very good French makes it a bit daunting. Many thanks if you can help at all. Thanks for the fast response, I appreciate it! That gives me something to go on. This may prompt me to go for a full moto licence if I DO actually have to do the course… always meant to upgrade from the 125cc ! driving test, crazy I know! Of course they don’t do this any more. up to 125cc max. If obtained as part of the car licence, then it only covers automatic 125cc, not manual. Thanks again for your response… I passed my car test in the UK in ’84 – so no “A” entitlement! I may well just go for the full test because, as you say, this course is expensive. Unfortunately, the UK has never issued a motorcycle licence with a car licence unlike other European countries. So it sounds like you either have to do the course or prepare for the full bike test. If you are happy to ride a 125cc only, then you can always prepare for the A1 licence, but if you want to ride a more powerful machine, then you need to prepare for either category A or A2. Just as a follow-up, I’ve checked with the legislation (http://www.ffmc.asso.fr/IMG/pdf/decret_12.11.10_-_formation_125.pdf), with my insurance company, and with French motards and it seems to be that my initial fears were unfounded – to be exempt from the mandatory training course, riders don’t have to “provide evidence that they have been riding a 125cc machine for at least the last five years”, but they need to be able to prove (via their insurance documents) that they have owned and insured (and therefore ridden) a 125cc AT SOME POINT within the five year period ending on 1st Jan 2011. Therefore I, having been riding my bike in 2010, am exempt. I need to make sure I keep the insurance documents from 2010 going forward as proof. Phew, that saves me €300! I still think it’s a good initiative to introduce this course. Hello Julia, if you hold a category A1 licence (motocyclettes legeres), you don’t need to attend the training. An A1 licence is a full and permanent motorcycle licence although you are restricted to ride machines of a 125cc engine size maximum. You should also check whether your A1 licence entitles you to ride manual and/or automatic bikes. If you obtained your A1 licence as part of the car driving test in the 1980s or 1990s, chances are that your A1 licence entitles you to ride automatic bikes only. Most scooters are automatic anyway, so you should have no issues. Happy riding! Morin, if your UK licence does not give you a category A, A1 or A2 entitlement, you cannot ride a motorcycle anywhere within the EU without passing the motorcycle test or complying with the local provisional arrangements. If you now live in France, and assuming you currently have no category A, A1 or A2 licence, you must complete the 7 hours training course and that will entitle you to ride a 125cc maximum. If you live in the UK or intend to return to live in the UK, you will have to complete the CBT course (and repeat it every 2 years) to ride up to 125cc. The 7 hours training in France are expensive and the UK CBT course is not cheap either, so you may want to consider preparing for a motorcycle licence. It will cost you more in the short term but will save you money in the long run, and it’s also peace of mind as a motorcycle licence is permanent. Good luck! I have taken my CBT in England but is has now expired. Does this paperwork entitle me to ride a 125cc motorbike in France because the French do not add an expiry date to their CBT equivalent. No Kaye, you have to complete the training in France or else take the motorcycle test that will be valid everywhere. The CBT course is specific to the UK and the 7 hours training session specific to France. I don’t think they can be exportable. Only a valid and full licence is exportable. I feared that might be the case but thank you for getting back to me so promptly. I currently ride a 125cc scooter in the UK with a full car plus cbt, I notice that whilst the new french rules state that car licence holders cannot ride a 125 without taking training the same piece of legislation also states that anyone with either C, C1, or D category on their licence and granted before 1st July 1990 still has A1 equivalence, as my UK licence clearly states I have C1 entitlement and was issued before that date I would assume I am still entitled to ride. I have a problem I don,t see here. I,m 58 years old and live in France, I have been driving a 50cc scooter for the last 3 and half years (52,000 km), now I would like to get a 125cc. I have never had a license of any sort. What papers do I need to look for to ride a 125cc. I\’ve recently moved to France and have purchased my first non-automatic 125cc motorbike this week. It looks as though I will have to take the 7 hours training soon to be able to insure my motorbike. My two biggest concerns are, not being confident enough on my motorbike as I have only just started riding (on private land) a geared bike and my inability to speak French (I am planning to take lessons soon). Anyway, I\’m off to the auto-ecole this afternoon to see what they have to say. Thanks for the blog post, it was really helpful! Could you please clarify something for me. I have a Russian driving licence (B), which allowes me to drive in France up to one year. Am I entitled to do the 7 hour training to ride a 125cc bike? Do I need to do the training? Thank you! I passed my test earl 1970’s and would like to ride a 125 cc scooter or bike whilst my wife and I holiday in Europe in our motorhome[we will carry bike on rack]. B/ BE/ C1/ C1E/ D1/ D1E. I would really appreciate any information you can give me. Just a quick update. I had to wait until I had my drivers license for at least 2 years which was a few weeks ago. I did the 7 hour training with an English speaking instructor yesterday and the day before. Day 1 consisted of riding around skittles at low and then high speeds on a Kawasaki KLX 125, this also included emergency braking. Day 2 consisted of 2 hours driving on the road, in traffic and on country roads with the instructor riding in a car behind. Before riding on the roads she explained car blind spots and how to use roundabouts properly. There was also a DVD in French which explained the physics of the motorbike and basic road rules including signage. At the end of Day2 I got a laminated cardboard card with my photo on which now allows me to ride 125cc motorcycles in France. Overall I’d say it was pretty easy even for a beginner like me, I did struggle on a couple of things but the instructor seemed to be happy at the end of the day. Thank you for the update and glad to see that everything went well with your training. We have had a number of queries from our readers about finding an English speaking instructor. Perhaps you wouldn’t mind letting us know the contact details of your instructor so we may pass them on to other English speakers who would like to undertake the training? Many thanks in advance. Hi folks I am an expat brit in France since 2004, still domiciled in UK.. can anyone help with this ..
if I return to the UK and I exchange my french licence for a uk will I keep my A1 entitlement and would I have to do the theory test if I wanted to take my category A direct access? ..
like everyone else I didn’t put a date on my post so it seems not possible to know just when they were posted, skribat 9th dec 2012. I have done two CBT’s in the UK, the first in January 2002 the second in January 2004. I passed my test (first time) on an automatic 125cc bike in January 2006 and obtained my full category A licence with a code 78 (automatics only). I bought a 125cc geared bike in October 2009 and rode this bike with L plates with the intention of obtaining a full category A licence without the automatic restriction. I have now moved to France with my bike and have had it re-registered here. Do I have to complete the ‘formation pratique pour le conduite d’une motocyclette légère’ (7 hour training course) before I can ride my bike here in France ? You will most likely need to take the French 7 hours training course as the CBT course taught in the UK is not recognised in France and is only valid in the UK. You will only be able to ride a bike in France without doing any further training if you hold a full motorcycle licence from any country that is a member of the European Union (or has signed agreements with the EU for that matter). Thanks for your quick response. From your reply, am I correct in assuming that I can ride an automatic bike of any size in France without any further training – as I have a full category A licence with code 78 (automatics only) but cannot ride a geared 125cc bike until I’ve completed the training course ? Again, thanks for your help. That’s right, you cannot ride any geared bike if you have an automatic bike licence. In order to be able to ride automatic bikes in France, you must hold a full automatic (or geared) motorcycle licence issued by any EU country. If you hold a full category A automatic licence and assuming the licence has been issued by an EU country, then you are entitled to ride automatic bikes in France, but ONLY automatic bikes. I feel that this as you said earlier with regard to the other measures the french wished to put forward for taxation purposses that this is another attempt to gather revenue.. At 300 euros a pop [ over £250] for a day it seems a bit stiff to me. I wonder just how much revenue will be collected. On the other I have to raise the question of say UK learner riders popping over the water, will they have to have completed such a course or is the CBT accepted for temporary purposses only.